The ideal compliment to a wax. The advanced rubber polymer technology removes both surface and embedded contaminants from paint, chrome and plastic with ease. An even, smooth paint surface means better wax results and maximum luster. The Surface Prep Mitt’s patented rubberized technology removes embedded contaminants, like paint overspray, water spots, tree sap and rail dust that you may not even know are there. 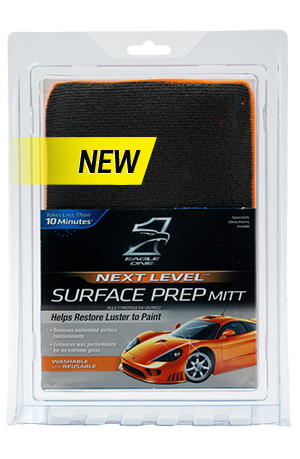 As a hassle-free alternative to the traditional clay bar, use the Surface Prep Mitt to wipe away embedded paint deposits in less than 10 minutes. Plus, it’s washable and reusable for up to 20 vehicles, unlike a clay bar. By removing contaminants, the Surface Prep Mitt provides a more perfect surface for your wax, resulting in greater light reflection and the ultimate shine. Use a piece of cellophane to amplify the microscopic surface contaminants in your paint and feel the impurities with your fingertips. We tested the surface prep mitt on our daily driver and found it worked as stated. The results after waxing made the car shine like never before. You can see and feel the difference. If you are serious about a detailed car, the Prep Mitt is a must in your cleaning kit.